The 20th edition of the XTERRA World Championship on Sunday garnered an unprecedented amount of media attention – from a BBC preview on Lesley Paterson to an associated press wire report documenting the incredible string of 20 straight Maui races for three locals and even an opening segment ESPN SportsCenter shout-out for men’s winner Josiah Middaugh. Have a look at the highlights video, photo gallery, and only-in-XTERRA dance video to get a feel for the excitement and passion emanating from off-road triathlon’s greatest day. 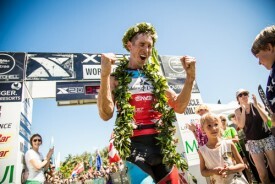 November 1, 2015 (Kapalua, Maui, Hawaii) – Josiah Middaugh, 37, from Eagle-Vail, Colorado and Flora Duffy, 28, from Devonshire, Bermuda won the 20th XTERRA World Championship off-road triathlon elite titles on an incredibly scenic day in Kapalua, Maui. It’s the first XTERRA World Title for Middaugh after 15 attempts, and he becomes the first American to win Worlds since Michael Tobin back in 2000. For Duffy, the win marks a perfect season with five straight wins, her second XTERRA World Championship in a row, and 12th XTERRA major victory in her last 13 attempts since the start of 2014. Middaugh and Duffy each received $20,000 for their respective victories. The total purse was $100,000, and the event was filmed for international television distribution. More than 800 endurance athletes from 43 countries participated in the event, which started in the relatively calm waters of the Pacific Ocean at D.T. Fleming Beach, continued with a 20-mile mountain bike that traversed the West Maui Mountains, and finished with a grueling 6.5-mile trail run. There was more than 4,000-feet of combined climbing on the bike and run courses. After 15 years of trying Josiah Middaugh has his world title. “15th time’s a charm,” Middaugh said to the crowd as he crossed the line, barefoot, holding the finish tape and an American flag with his son Porter and daughter Larsen by his side (his oldest son Sullivan and wife Ingrid were watching in admiration). The men’s race started out as expected with all the fast swimmers getting an early jump … Courtney Atkinson, Ben Allen, Jens Roth, Mauricio Mendez and Sam Osborne were the first to hit the 20-mile bike course. What wasn’t expected was how well Middaugh would swim. He was still two minutes behind the swim leaders, but more importantly he was side-by-side with Ruzafa. Last year he was 1:41 down on Ruzafa coming out of the water. “You never know how you are going to feel, you always feel sluggish the morning of the race. I felt good in the water though and I was psyched to come out with Ruben,” said Middaugh. Those two worked their way to the front of the pack on the bike in no time but after a crash set Middaugh back, Ruzafa pounced. Ruzafa did indeed put some time on the pack, but the effort took its toll. “At the top of the climb I passed Josiah and I put some time into him and arrived 1:45 at T2, but my body was not the same and I exploded on the run,” he explained. Braden Currie and Francisco Serrano also had their share of misfortune. For Currie, it was a false alarm. For Serrano, it was a broken seat that went flying off halfway through the ride. Indeed he was, finishing 6th just 30 seconds behind Atkinson who ran his way into 5th. Back to the front of the race, Middaugh was 1:40 down and then went to work. Middaugh said he also felt inspired. While Middaugh didn’t post the fastest run – that honor went to Mauricio Mendez and his 40:51 split which propelled him from 8th at T2 to 4th at the finish line – he did have the biggest dream come true. Braden Currie, who had been battling with Middaugh all year on the American Tour, turned on the jets in the run and finished runner-up, his best showing yet in Maui. “I wasn’t expecting it at all. The last split I got was three minutes down towards the top, and I thought that was that and I was happy with third but then all of a sudden I saw Ruben halfway down the downhill and he was sort of in a box and I think he maybe overheated,” said Currie. As for Ruzafa, who had his 15-race win streak broken and his chance to become the only elite man to win three in a row disappear, he was just happy to finish. Duffy had the fastest women’s swim split (5th overall) and was 3:45 up on two-time XTERRA World Champion Lesley Paterson out of the water. Paterson posted the best bike split to pull back a couple of minutes and was seemingly in striking distance heading out on the run. Paterson was in a similar spot in second place. In the end Duffy took the tape in 2:54:17, five minutes in front of Paterson. Emma Garrard had a great race of her own to finish in third position, yet another step forward in her amazing progression through the years (she was 5th two years ago, and 4th last year). Garrard was once again the top American finisher. Myriam Guillot-Boisset used a great run to move into fourth and Lizzie Orchard had the best race of her XTERRA career to finish in 5th. Also: Elisabetta Curridori, Maia Ignatz, Kara LaPoint, Verena Eisenbarth, Alena Stevens, Fabiola Corona, Debby Sullivan, Christine Jeffrey, Laurel Dudley. Christophe Betard from France was the top amateur finisher and placed 20th overall, just 23-seconds ahead of Martin Kostelnicak of Slovakia. It’s the second straight-year Kostelnicak (pictured above) has won the 25-29 title, and he was the third amateur overall last year. Martin Flinta (who was fourth amateur last year) was third amateur this year and won the 40-44 division for the second time. Benoit Lalevee also won Worlds for the second time (50-54) while Bruce Wacker won the 65-69 division (his third title) and Ed Fattoumy won the physically challenged division for the 10th time in 11 years. Julie Baker won the overall amateur XTERRA World Championship women’s title and finished 13th overall, less than one-minute ahead of Liz Grubber. Those two were the top two amateurs (and 4th/5th overall at the USA Championship in September as well). It’s the third-time Gruber has won her division (25-29) in Maui, and Mimi Stockton (40-44) also picked up her third title. Carol Rasmussen (50-54) and Libby Harrow (65-69) won their second, Cindi Toepel won her sixth, and Wendy Minor won her eighth. Ben Hoffman won the 2015 Outrigger Resorts elite men’s double award and $2,500 prime today and finished 10th overall. His combined time was 11:55:18 (9:05:22 IM + 2:49:56 XTERRA). Arnaud Bouvier from France won the men’s amateur double in 13:28:52, just over five minutes faster than Jorg Schneider of Germany; while Nicole Valentine of Maryland won the women’s double for the second straight year despite racing through an injury. Each earned a six-night stay at an Outrigger Resort in Maui for their efforts. TEAM Unlimited is a Hawaii-based television events and marketing company, founded in 1988. It owns and produces XTERRA and in 2015 offered more than 300 XTERRA off-road triathlon and trail running races in 30 countries worldwide. In addition, TEAM TV has produced more than 400 adventure television shows resulting in three Emmy’s and 42 Telly Awards for production excellence since 1990. Learn more at www.xterramaui.com, xterraplanet.com, xterratrailrun.com, xterraeurope.com, and xterraasia.com.